April 11th is the anniversary of Lake Ann’s third and final “big fire.” Like many of the logging towns in northern Michigan, fire was a constant threat in Lake Ann. Piles of logs, stacks of lumber, sparks from steam engines and fires associated with saw mills, added to closely spaced homes and businesses of wood frame almost invited disastrous conflagrations. The village of Lake Ann suffered three major fires in its early history. The first, and most disastrous, struck on July 4th, 1897 and burned nearly the entire city. This fire began in the large saw mill, owned by William Habbeler, on the lake shore. The mill was rebuilt but much of the city was not. 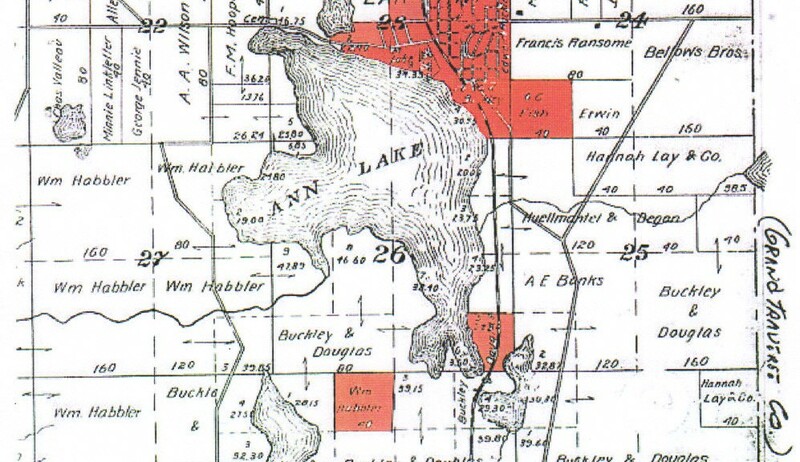 Lake Ann’s population prior to the fire was about a thousand. After the fire it was merely in the hundreds. 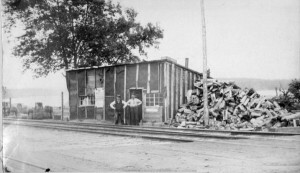 The second fire, in 1902, burned the business district which was much smaller than it was in 1897. Businesses occupied an area much like that of today. Dedicated 1883, burned 1918. Image courtesy of the author. 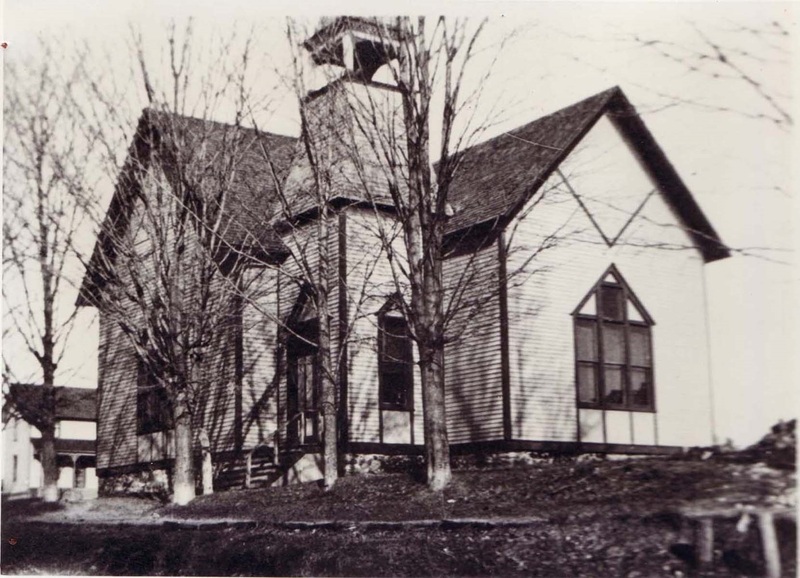 The third fire, April 11, 1918, burned the Congregational Church, several nearby homes and William Habbeler’s mill. This mill was smaller than the original mill on the lake shore and apparently made barrel staves and headers, which would explain the designation “the old cooperage” in the account of the fire. 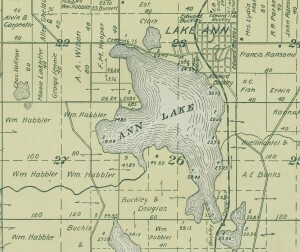 Plat of Lake Ann, 1901. 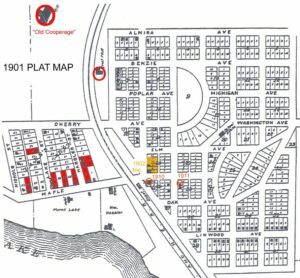 Map enhanced by the author, shows location of the “old cooperage,” and the three major fires. 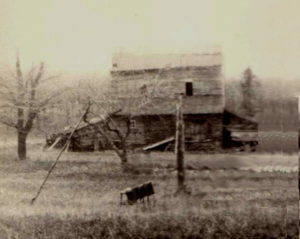 In 1889, following the first big fire, William Habbeler purchased a second mill, located just northwest of the village. Perhaps he reasoned that this mill, located far from town, in a large open field, would not start another disastrous fire. Revised map of homes burned in the 1918 fire, complied by the author. The third fire started in the Alex Frazer residence, apparently from a defective chimney. A high northeast wind was howling and sparks and flames from the dwelling were carried to the next. Dwellings of the following residents were destroyed: Alex Frazer, Mrs. O. Morton, William Habbeler, Dave Henry, Mrs. George Tyler, L.O. McFann, Charles Warner, and three homes belonging to M. L. Lake. This was the third time the home of William Habbeler was destroyed by fire. Two endangered other nearby structures were saved by heroic action of the village residents. The Schneider home was in the direct path of the westward spreading fire. Men climbed on the roof and poured buckets of water, passed up to them, on the roof. They were able to keep it wet and safe from blowing sparks and embers. Likewise, across the main road, Kate Decker Dohm, resident housekeeper for many years, kept the roof of the Dohm Resort wet. Kate was related to Merrill Lake, who built the Lake Hotel about 1892, and served as his housekeeper. She inherited the hotel, married Henry Dohm and continued to work at the new resort. Because the business district was spared this time, life in the village continued much as before. The Habbeler store, rebuilt after the 1897 fire, is now the Lake Ann Grocery. The Burnett store and the Huelmantle store, rebuilt after the 1902 fire, are today the B & M Party Store (which closed in early 2017) and the Stone Oven restaurant respectively. The saw mills and grist mill are long gone but today the village of Lake Ann is a vibrant, thriving place. New businesses include a brewery and a coffee shop. As generations pass, memories of the three serious fires are fading but Lake Ann certainly is not. M.L. 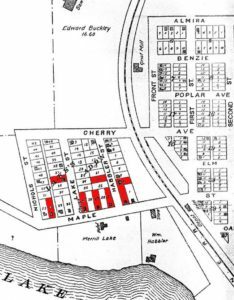 Lake owned many lots in Lake’s Addition (the area where the fire took place) so it is not known where his three houses that burned were located. The Schneider home (lot 43) did not burn. every particle of inflammable material in their path had been consumed. The fire started in the A. Frazer residence, apparently from a defective chimney. Flames were not discovered until the fire was too well under-way that the roof was ready to fall in. A high northeast wind was howling and sparks and flames from the dwelling were carried to the next, and from that, on westward through the town. around, lent their assistance in battling the fire, but to no avail. The fire did not stop until it had exhausted the material, and the balance of the city was spared only because the wild wind did not change. Loss, as a result of yesterday’s fire, Is estimated at $10,000. Dwellings of the following were destroyed: A. Frazer, Mrs. O. Forton, William Habbler, Dave Hempey, Mrs. George Tyler, L. O. McFann, Charles Warner, and three homes belonging to F. L. Lake. being removed when it became apparent that the houses were doomed. The C. L. Foster store was saved. Whether or not Lake Ann will be rebuilt is unknown. This is the third time the town has been virtually destroyed by fire, one about 20 years ago, once in 1907 (sic – 1902). Each time the place has come up out of the ruins, smaller than before being ravaged by fire. William Habbler, one of Lake Ann’s substantial citizens, whose home was lost, is in Ohio on business and nothing will be known as to his plans for the future until his return. Richard Leary is an active volunteer at the Almira Historical Museum in Lake Ann. Leary is passionate about exploring and documenting the history of Almira Township, and finds inspiration equally in studying written records and in traversing the fields. After a dozen years researching the history of Lake Ann, Michigan, it has quite evident that people’s memories are not always accurate. People can be very certain of a date or name or event and be quite wrong. The first instance of this in my research on the village of Lake Ann were the dates of the three major fires that burned significant portions of the village. The first and by far the greatest was on the fourth of July, 1897. That date is well known to village residents. The second fire, that burned the business district, is known far and wide to have occurred in 1914. That date was established in a newspaper story many years ago and the date 1914 has been repeated ever since. Unfortunately, a check of old newspapers proves that the fire was in 1902. The third fire, known widely as the 1917 fire was in April 1918 and we mark its anniversary next year. 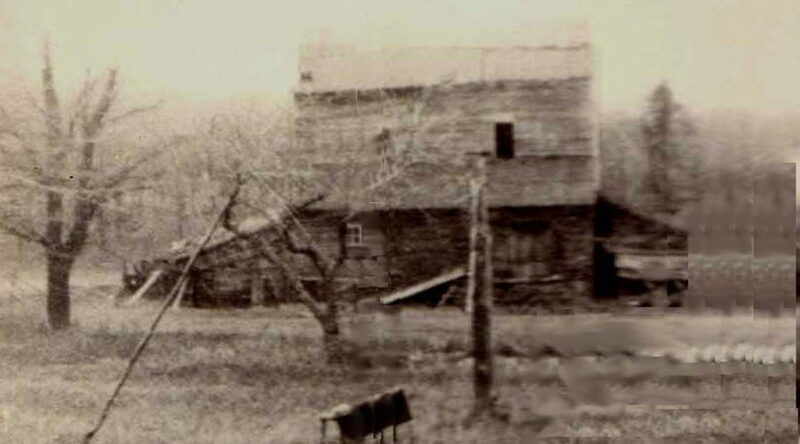 A grist mill, but not owned by a Thompson, in Lake Ann, undated. Image courtesy of the author. Another erroneous fact is the identification of the grist mill in Lake Ann as the Thompson grist mill. People have said for many decades the Harvey Thompson built and ran the grist mill. However, a search of tax records and deeds shows that no Thompson ever owned or ran the grist mill. Harvey Thompson and a partner, Mr. Elton, started a saw mill about a hundred yards from the grist mill about the same time (1896 and 1893 respectively). After just a few years, the mill was sold to William Habbeler who built, owned and ran the first and biggest saw mill in Lake Ann. It would appear the proximity of the mills, the passage of time and the vagaries of memory combined to mix the mills. Now I am on anther quest, trying to unravel memories, written account and sketchy facts. Once again I rely on tax records, land records, village minutes and newspaper mentions to find the truth. The story begins with more “well known” information. 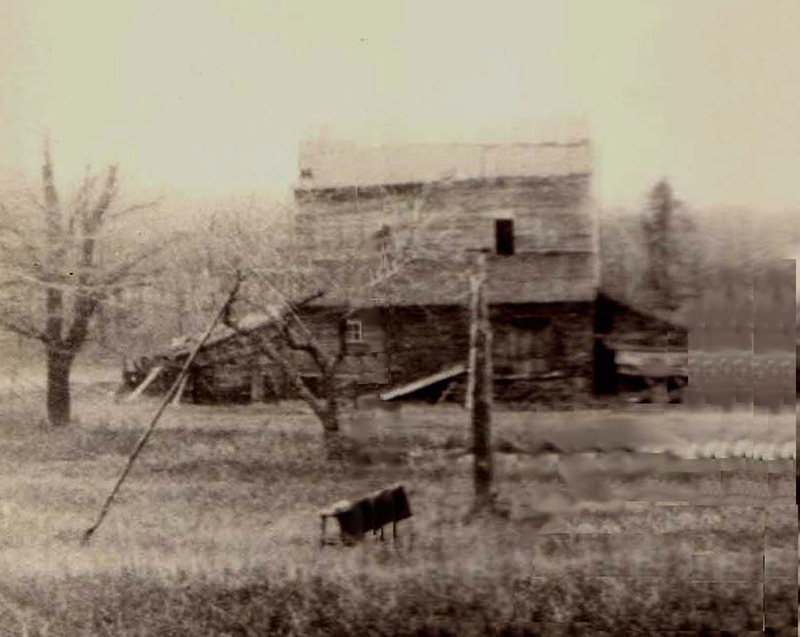 About 1900, two houses were moved from along Ransom Creek, site of the first settlement in the Lake Ann area. At the time it seemed houses and even large buildings were moved from place to place, usually on sleds over frozen ground or ice covered lakes. Elijah Ransom owned the saw mill operating beside the creek and later a grist mill. There was a cluster of shanties, a couple of houses and a large store close by. We know from contemporary newspaper accounts that Addison Wheelock, first settler in the Lake Ann area, had a home in that settlement. His home was large enough that the planning session for creating Almira Township and the first meeting of the elected township officials took place in his home. I assume that Elijah Ransom, being the most prosperous person around, had a decent home there as well. Because this all took place in the early 1860s, tax and land records are rather limited. People didn’t always own the land they were occupying. Having prowled the woods along Ransom Creek, I know of three depressions where the village must have stood. The largest is surely the site of the store. The two smaller are, I believe, the sites of the two real houses in the early settlement. Believing that the accounts of two houses being moved from near Ransom Creek to the southeast corner of the village, it made a good story that these house belonged to Elijah Ransom and Addison Wheelock. The “well known” story was that these two houses were later occupied by the Dr. Shilliday family (now the Shilliday House B&B) and the Burnett house just to the south, also on South Lake Ann Road. The latter once occupied by S. S. (Sam) Burnett, local businessman and family and later by the Bryan family. It was such a great story. I had located a house once lived in by Addison Wheelock, my wife’s great-great-grandfather. I thought I was finally through my Lake Ann research. Ah, but questions arose. Not everyone was certain the Burnett house had been moved. Or perhaps not in 1902 as the village minutes had led me to believe. The village minutes did say the Ransom store and A dwelling were moved from along Ransom Creek in 1902. Back to the Benzie County Court House. 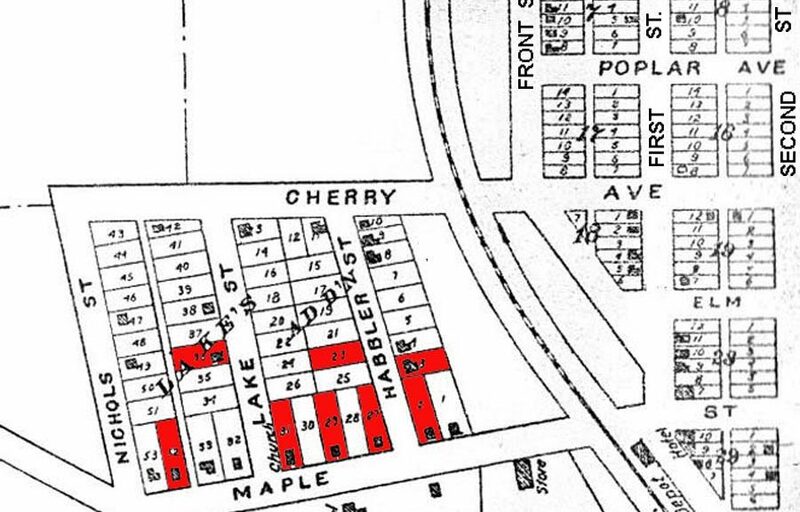 The tax records indicate several owners of lot 4, block 29, site of the Burnett house, in the years between 1895 and 1903. For all but 1895, the value of the property suggests a house was on the lot. But, of course, there is no information about the house, certainly not its history. Mr. Degan, an early owner of the lot on which the Burnett house stands (1899-1903), served on the village board and was active in moving mill machinery, water works pumps and water pipes off the Ransom Creek site. Degan and Huelmantel bought “the entire water works machinery and wheel and the mill machinery in the old mill” for the sum of $250 in 1900. Could Mr. Degan have moved a small house without a mention in the minutes? Oh yes, in 1901 a “wagon shed or house” on the creek was sold to someone for $4.00. Ah, but there is more. In 1900, the village approved the rental of “the old Ransom house” to a Mr. Thatcher for $2.00 per month. Of course, they don’t say where that house is located. Still by the creek? Surely not the Burnett house. Mr. Thatcher paid taxes on a lot on Lynwood, three blocks from South Lake Ann Road and the Burnett house. Was he living in the “old Ransom house,” now located on Lynwood Street? Granted, knowing which house was where 117 years ago is not crucial to Michigan history. Even I don’t lie awake nights wondering. But for the sake of accuracy, and personal curiosity, I would like to know. So, while I know with certainty that memories, and even some newspapers stories, can be inaccurate, I do not know which house is which. It is like trying to keep track for which nut shell hides the bean as they are shuffled rapidly before your eyes. Personal “histories” or reminiscences can be very useful. even indispensable but they must be supported by facts such as deeds of tax records. At least I think his name was Sergeant Friday and I think that is what he said. Three times the village of Lake Ann was nearly destroyed by fire. Twice, the business district was virtually wiped out. Each time the people rebuilt their homes, businesses and lives. In addition to the three major fires, fire destroyed two prominent business structures: the Douglas Hotel and Bert Smith’s residence, black smith shop and hardware store. The first and third of the major fires are well-known and were dramatically described in Traverse City newspapers of the day. The second major fire is far less known and the date of the fire wrongly remembered and wrongly published. The dates of the Douglas Hotel and Bert Smith’s store fires were also lost to history. The following is an accurate account of these five fires complete with citations from newspaper stories of the period. This fascinating, if unfortunate and sad, part of Lake Ann’s history deserves to be remembered correctly. The first and most devastating fire occurred in July 1897. At that time the village was large and prosperous. Its population was about 1,000, making it one of the larger towns in northwestern Michigan. Logging was a major employer and supported several saw mills. The William Habbler Jr mill on the north shore of Ann Lake was the biggest. The mills brought in many other businesses, from boarding houses to bakeries, grocery stores, barbers and doctors. As in any town employing so many men, saloons, pool parlors and poker games could be found as well. Some of the buildings and homes were well built and up-to-date architecturally. Businesses were adjacent to one another in the business district. Homes and business buildings were made of wood. Lots were small – often 100 feet deep and 40 feet wide – so homes were close together as well. Other buildings, such as barns, sheds and other out buildings were more rustic and even more flammable. Once the fire began, apparently from a spark at the Habbler saw mill, a breeze north from the lake spread the fire rapidly through the town. Within minutes it was out of control. Because nearly all the town was north of Ann Lake, just about everything was within the fire’s path. Because it was Saturday of the Fourth of July weekend, many of the town’s residents had rowed across Ann Lake to a favorite picnic spot on Piney Point. When they saw the smoke and fire in the village, there was little they could do to return home in time to save their belongings. According to the newspaper accounts of the fire, 50 businesses were lost and 75 homes burned. Most people lost everything they owned. Lake Ann is a mass of smoldering ruins, and there are scarcely thirty buildings left standing. The fire broke out in Habbler’s mill at 1:30 p.m. Saturday and spread through the town with lightening rapidity. The entire business portion of the village has been swept clean by the most disastrous conflagration that has ever visited this locality. Not less than 75 families are homeless and nearly all of them have lost all their possessions. Many were fortunate in saving their lives. The prompt response from Traverse City brought the steam fire engine and twenty members of the department from that city. When the much needed aid arrived, the men who had been fighting fire with all their strength were nearly worn out but they were relieved by the arrival of fresh and efficient help. When the special train bearing the engine and firemen from Traverse City entered the pall of smoke, the spirits of the discouraged and unfortunate ones arose and hopes of saving what remained were revived. It required but a few moments to transfer the engine from the flat car to the shore of the lake, just west of the factory, and but five minutes to start two streams. A well-organized force manned the hose lines, and soon two heavy streams were pouring into the fierce flames which threatened to consume everything that remained. After a half-hour’s hard work, the flames at the points mentioned were under control. It was necessary to run one line of hose along the shore among the slabs, timber and miscellaneous lumber stock, but the energetic work of the men was effective and showed good results. That was the time which elapsed after the fire engine left the Cass street engine house before two powerful streams of water were pouring upon the destructive flames which were destroying the greater portion of Lake Ann Saturday afternoon. When the special arrived at Lake Ann, the people were almost panic stricken and it seemed as though the entire village was to be swept out of existence. The Traverse City firemen with commendable coolness and precision immediately began work in earnest. Only a few moments were required to transfer the engine to the lake shore, just west of the burning mill and cooperage stock. A team was found at once and the engine hauled to the shore and placed upon an improvised dock of slabs. Firefighter Fulgham lost not a moment and effective streams were doing good work in a few moments. The men worked with an energy characteristic of the Traverse City firemen and Lake Ann’s business men and citizens felt relieved when the excellently organized force went to work. They labored like tigers and their work immediately began to show satisfactory results, while the engine worked like a charm and threw streams which stayed the fast advancing flames. One can imagine seeing this on the cover of a paper beside the check-out in any grocery store today. The date of Lake Ann’s second major fire has been incorrectly known for many years. Even the newspaper report of the third fire, in 1918, gave the wrong date, saying it occurred in 1907. More recently the date has been given as 1914. In reality, it happened in 1902. 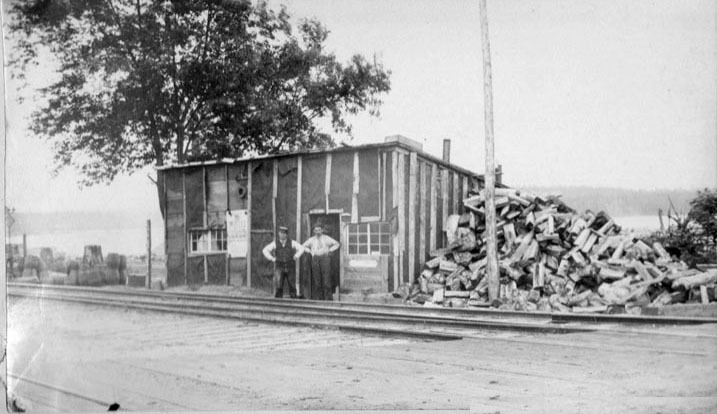 The second fire also destroyed most of the Lake Ann business district but it was much smaller than that of 1897. It is clear that little of the village had been rebuilt following the devastating fire in 1897. Again the Traverse City papers gave it prominent coverage. Lake Ann Jan 28 — Again last night the business portion of Lake Ann was laid in ashes, and nothing but cinders remain of four of the principal businesses places of the town. The saloon building and stock of Dan Willard, the store building of A. B. Huellmantel, the livery barn of W. J. Shilliday and the store building occupied by S. S. Burnett, were completely destroyed and the stock of A. B. Huellmantel and S. S. Burnett were greatly damaged. “The fire started in the saloon of Dan Willard about 9:30 o’clock. The saloon had been closed for the night and Mr. Willard had gone home. The fire had been banked for the night but in some way a blaze started from the place where the stove pipe passed through the second floor. Once again, the people of Lake Ann rallied and the village survived and rebuilt. Soon after the fire, a large, elegant hotel opened in the center of town. The hotel, being across the tracks from the M. & N. E. Railroad depot, perhaps served as a destination for people coming on railroad excursions from Manistee or Traverse City. The hotel was close to the shore of Ann Lake and maintained a number of small boats for guests to use on the lake. Origin of the fire is unknown but it started in the roof – Loss on building is $2,500 with insurance of $1,200. Lake Ann, Mich. May 13. — The Hotel Douglas, the only all-year-round house in Lake Ann, was totally destroyed by fire at 6:00 o’clock this morning. The house was well filled with guests but all escaped, although some lost their personal belongings. The loss on the hotel is $2,500 with $1,200 insurance. The insurance on the contents is $1,200 but as some were saved, L. E. Knoedel, the landlord, is unable to give his loss. The fire originated in the roof near where the two buildings came together. The alarm was quickly given and a bucket brigade was soon on the scene, the men doing very effective work. Fortunately, the wind was from the north, blowing the fire toward the lake, else it is very likely that the entire business street would have been destroyed. It was only by the great effort that the home of Dr. Shilliday and the house and store of S. S. Burnett were saved from destruction. The fire spread very quickly and while many of the guests were still asleep when the alarm came, all got out fully dressed, although some left their baggage behind. In 10 minutes, the hotel was a heap of smoking ruins. Another major fire happened in 1911. Although not as devastating as the fires of 1897 and 1902, it was significant and probably spectacular. B. E. Smith’s residence and store were destroyed by fire Monday noon; it was nearly a total loss as only a small part of the contents were saved. Mr. Smith carried no insurance. The rest of the town was only saved by the heroic efforts of the Lake Ann bucket brigade as there were several buildings which caught fire. Some recollections mention the explosions that occurred as the building burned. The large two-story building was a combination residence, blacksmith shop, livery and hardware store. As such, it no doubt contained hunting ammunition and black powder used for reloading gun shells and blasting tree stumps out of the ground. The village of Lake Ann had not experienced its last major fire. The third fire did not destroy the business district, as had the first two big fires. The final fire to sweep through the town primarily burned homes. Once again we look to the newspapers for a compelling account of the conflagration. Half the village of Lake Ann lies in charred ruins today, the result of a fire yesterday afternoon, that swept its course, leveling ten dwellings, the congregational church, three barns and the old cooperage. Nor did the flames stop their ravaging work until every particle of inflammable material in their path had been consumed. The fire started in the A. Frazer residence, apparently from a defective chimney. Flames were not discovered until the fire was too well under-way that the roof was ready to fall in. A high northeast wind was howling and sparks and flames from the dwelling were carried to the next, and from that, on westward through the town. Bucket brigades were formed, and farmers, who drove in from miles around, lent their assistance in battling the fire, but to no avail. The fire did not stop until it had exhausted the material, and the balance of the city was spared only because the wild wind did not change. In spite of the fires that destroyed the town’s business district, Lake Ann survived. An article in the Traverse City Evening Record in 1907 gave evidence of this perseverance. Lake Ann, Mich. Jan. 10 —Lake Ann was twice visited by disastrous fires. In fact, both conflagrations nearly destroyed the entire town and each time, before the ashes had cooled off, the business men of Lake Ann were planning for the reconstruction and after two hard struggles a pretty village full of life and spirit remains as a result of their perseverance and pluck. This was just as true after the third fire in 1918 as it was after the second fire. 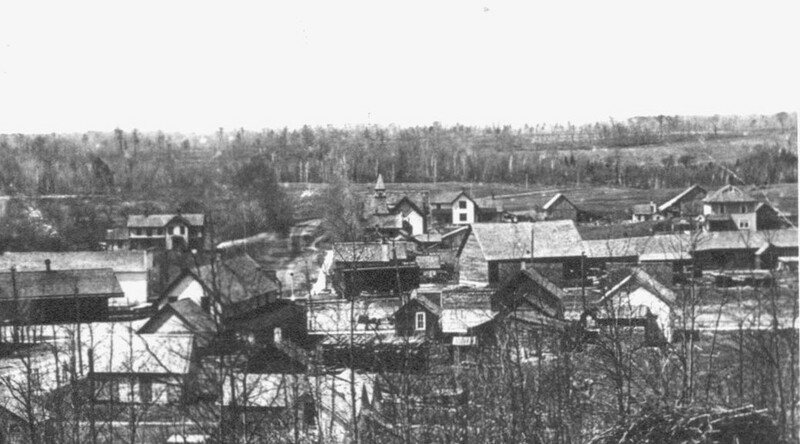 Lake Ann business district between 1902 and 1910. The village lives on. Habbler’s store, which survived the last two fires, is now the bustling Lake Ann Grocery. S.S. Burnett’s store, rebuilt after the 1902 fire, is now the B & M Party Store and holds down the center of town. Huellmantel’s shoe store, also rebuilt after the 1902 fire, is now a busy restaurant, the Stone Oven. Two new businesses opened in 2014 (The Red Door and Lakeview Realty and Rental Management) and another is scheduled to open early in 2015. The village of Lake Ann survived three nearly disastrous fires, outlived logging and the M&NE railroad. It continues, in its own way, as a busy, but laid-back, friendly center of activity for locals and tourists alike. The Manistee and North Eastern Railroad (M. & N. E. R. R.) played a large role in the formation of many towns along its route. It served the Grand Traverse region for nearly a half century, hauling logs, lumber, produce and people. For many years, 1892 to 1934, it connected Traverse City to Manistee and numerous towns in between. The Manistee and North Eastern Railroad was organized in January 1887 at a meeting at the Buckley and Douglas Lumber Company in Manistee, Michigan. William Douglas and Edward Buckley were the principals behind the railroad. The M. and N.E. was to extend 75 miles from Manistee to Traverse City. The primary purpose of the railroad was to bring logs and lumber from northwestern Michigan to the big Buckley and Douglas saw mills in Manistee. Construction started in spring of 1888 and had reached Onekama when the railroad opened for freight business in October 1888. Track laying continued northward, reaching Kaleva and Lemon Lake by April 1889 and Nesson City by September that year. Tracks were extended to Interlochen by June 1890. At first there was no passenger service; the railroad, as planned, only hauled logs. The first passenger train on the M. & N.E. ran on January 6, 1889 as far as Bear Creek, a distance of 20 miles. The M & N E added a second engine in 1889, using it on the passenger service. According to writer Margie Fromm, the train was: …impressive, with its green and red plush interior and newly painted wine exterior. The train consisted of the locomotive, one coach, and combination smoking and baggage car. Additional coaches were soon added. The tracks reached Lake Ann in October 1890. Passenger service as well as log and freight hauling to Lake Ann started that year. In many ways, the village of Lake Ann was typical of the interaction of the M & NE Railroad and the towns along its route. In some cases a town was created by the railroad but in all cases the towns grew with the coming of the rails. The first passenger station was near Ransom Creek. A dispute with the Ransoms over excess timber cutting beside the railroad right of way resulted in the station being moved to Lake Ann. The first depot in Lake Ann was quite rustic. 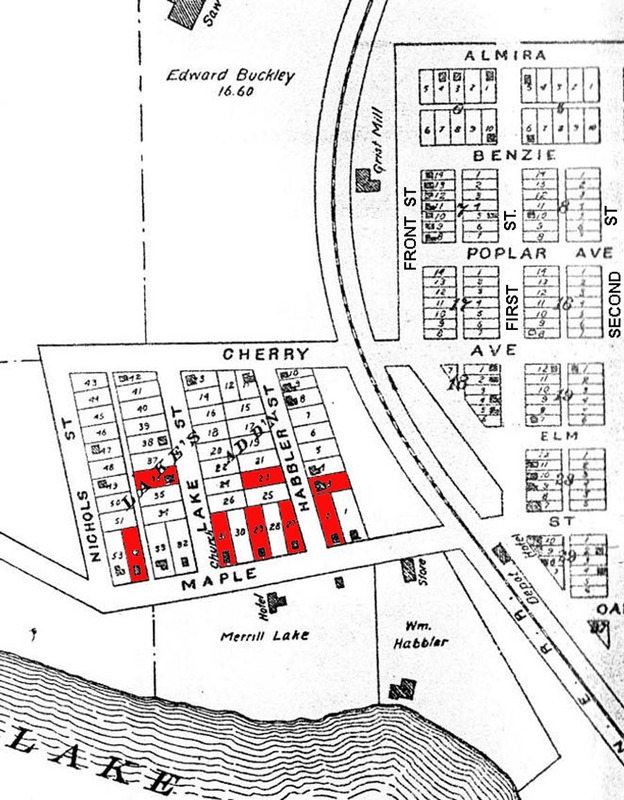 A new station was soon built, just south of the main street, Maple Avenue, opening in May 1892. The station had a waiting room for passengers at one end, an office for the railroad agent and ticket window in the center, and a baggage and freight room and loading dock at the opposite end. Overall, Buckley and Douglas built a first class railroad. At that time, most logging railroads were narrow gauge but Buckley and Douglas began with standard gauge tracks. In addition to quality passenger cars and depots, they used some of the heaviest rail then in use. The Manistee Daily, in May 1899, described the railroad as follows: The Manistee & North Eastern is something unique in its way, as it is believed to be the only one of anything like its size, standard gauge, thoroughly built and equipped and operated after the manner of the larger lines with freight and passenger trains, express, mail, train dispatchers, own telegraph lines, etc. To that Edward Buckley added, One [coach] is a first-class, 60-foot car that is equal to the best of the Chicago and West Michigan. The large volume of timber available in the Lake Ann area delayed the expansion of the railroad. The tracks were not extended to Traverse City until June 1892. Because the railroad terminated in Lake Ann for about two years, a turntable was built at the end of the line on the north side of the village. This allowed the engine to be turned around before making the return trip south. It was completed in December 1891. Benzie Banner, Dec. 10, 1891: The turn table is now in working order at the lake, and the awkwardness of running the trains backward is no longer a necessity. The turntable was small, just long enough for the small locomotives. It was no doubt turned by human power; one man could do this by pushing a bar that extended beyond the end of the turntable. It may have been removed when the M&NE tracks reached Traverse City in 1892 as it would no longer have been needed to turn locomotives. Initially a siding was built in Lake Ann to serve the Habbler saw mill located on the lake shore. Later, as logging declined, agriculture became important. Potatoes, in particular, grew well in the sandy soil and became a major crop. Potatoes were brought by wagon to Lake Ann where they were sorted and loaded into boxcars. 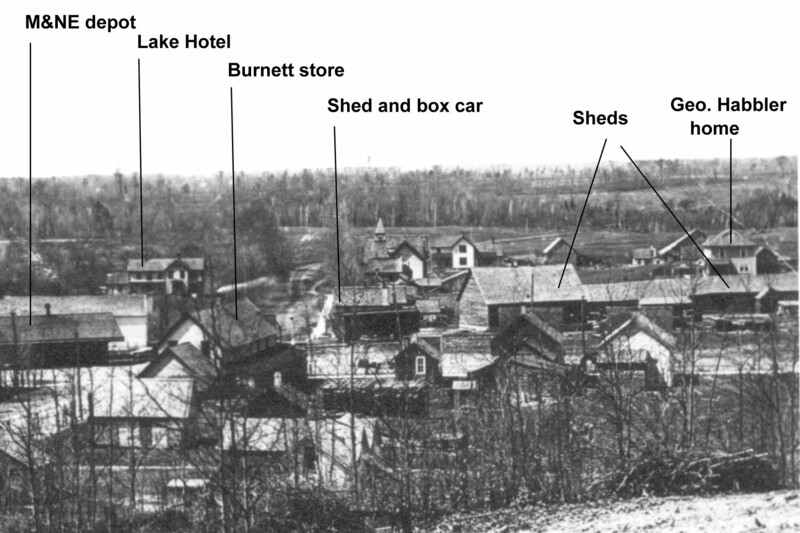 Lake Ann business district between 1902 and 1910. Railroad operations depended on the close proximity of storage units for goods and equipment. Several sheds were located beside the M&NE tracks on the north side of the village. A large potato shed was most important. 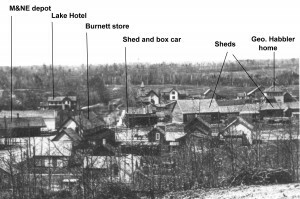 Photographs of the village, taken from the school hill, show boxcars beside the sheds. According to the Twenty-first Annual Report of the Railroad Commission (1893), the M&NE rolling stock included nine locomotives, five passenger cars, two express and baggage cars, four box cars, 225 platform (logging) cars, four conductors’ cars and one other car. In 1910 the Manistee and North Eastern Railroad was at its peak. It owned 355 miles of track, 15 steam locomotives, 2 snow plows and numerous other pieces of equipment. Over the years, a number of branches were laid from the main line. A major line was extended north from Hatch’s Crossing to Northport and another from Solon to Provemont (now Lake Leelanau). A branch extended west from Platte River Junction (just south of Lake Ann) to Empire Junction. The last and longest, in 1910, ran from Kaleva to Grayling. It extended the life of the railroad by opening a large new area of prime timber. For several years, two passenger trains were operated daily in each direction, one in the morning, the other in the afternoon. By 1921, only one train was run in each direction. At its peak in 1915, the M & NE carried 190,000 passengers. The coming of the automobile reduced the need for passenger service between towns. Ridership declined along with freight traffic, leading to the inevitable end of the Manistee and North Eastern Railroad. As logging declined in the region, the volume of freight declined and the M & N E, like many railroads during World War I, fell on hard times. In 1931, the Pere Marquette Railroad took control of the renamed Manistee and Northeastern Railway. Gradually, segments of tracks were abandoned and service discontinued. By July 1934 the last freight train departed Lake Ann. The tracks between Kaleva and Solon were abandoned in 1934. The station in Traverse City was closed later that year and the railroad’s offices moved to those of the Pere Marquette Railroad. The M & NE tracks were removed by October 1934. The Lake Ann depot was torn down about 1935 to make room for the new town hall. New Lake Ann depot, ca. 1892. Even though one could hop in an automobile and drive from town to town on a developing system of roads, the railroad was not far from people’s minds. I suspect many people missed the excursion trains to Traverse City or Manistee, the shopping jaunts by the ladies, the business trips into the city by groups of men, or the fall hunting trains. The railroad was more than hauling lumber or produce: it could be a social occasion in its own right. In many ways the Manistee and North Eastern was missed by the people along its former route. Even now, segments of the right of way can be followed by those willing to explore the fields and woods of the Grand Traverse region. There, one can reflect and imagine the sounds and smells of the steam locomotives of long ago. Only Memories Remain of the M & N E RR, Margie Fromm. Originally printed in the Preview Community Weekly. Vol. 9, no. 36, Jan. 14, 1985. Reprinted in various Railroad Guide and Depot Tours published by the Benzie County Museum. The History of the Manistee & Northeastern Railroad Company, Peter Schettek, Sr. of Cedar, Michigan. Undated typescript at Traverse Area District Library, Woodmere branch. Lake Ann and the Manistee and North Eastern Railroad, Helen White and Art Thompson., Benzie Heritage, vol. 1 no. 4, fall 1982, Benzie County Historical Museum. The Manistee & North Eastern Railroad, Manistee Daily, May 1899. Available on the Internet. Contributor Richard Leary and his wife, Eleanor Riehl Leary, are summer residents of Lake Ann. Addison and Ann Wheelock, my wife’s great-great grandparents, were the first European settlers in the Lake Ann area. The lake, Ann Lake, was named for Ann Wheelock. While Eleanor was doing family history research, I began researching the history of the village of Lake Ann. The village has a long and fascinating history, extending from its logging days in the 1860s into the early 20th century. 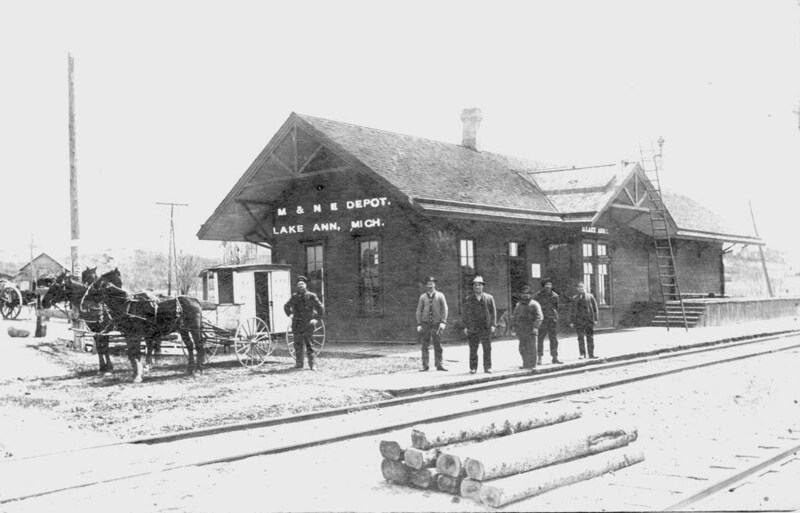 At the turn of the century – 19th to 20th – Lake Ann was a tourist destination, with daily trains bringing people from Traverse City and Manistee. An elegant hotel, the Douglas, stood just a short walk from the fine train depot and another hotel, the Lake Hotel, was just down the road. Lake Ann boasted (if that is the correct term) of a half-dozen or more saloons, good card games and, according to rumors, several brothels. 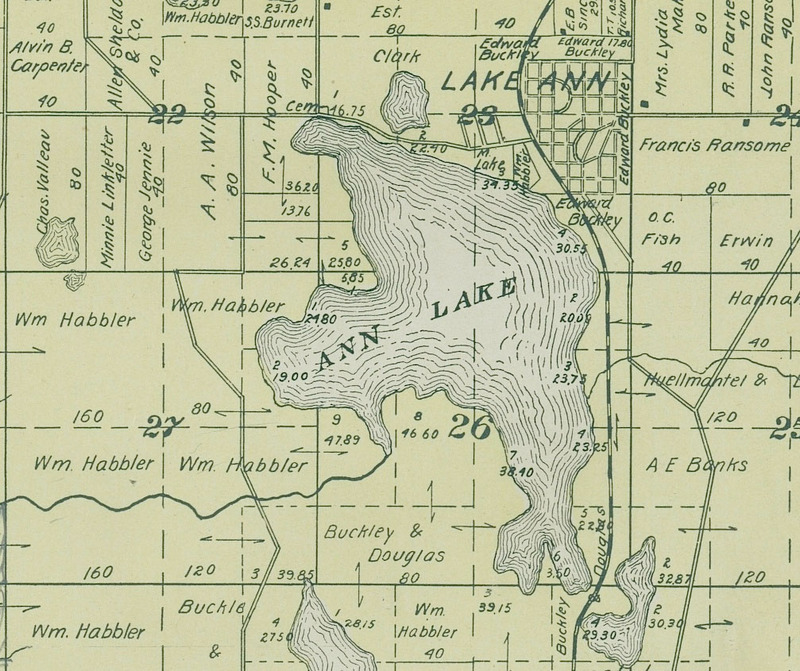 Among Lake Ann’s more noted historical events were three major fires, each of which nearly destroyed the town. Lake Ann survived and today is a busy, growing community. During the spring and summer of 1862, three groups of settlers arrived in the area that later became Almira Township. They homesteaded different places and later obtained land grants for their land. Addison (28) and Ann (28) Wheelock, with their first two children, Ebenezer (6) and Mary (3) settled on the north shore of Ann Lake. Addison named the lake for his wife. The Wheelocks came from Vermont. Andrew (32) and Almira (30) Burrell arrived about the same time. They settled on the north side of Sancrainte Creek. An area northwest of Ann Lake was informally known as “Sancrainte Hill.” This is consistent with Andrew Burrell’s land grant. The township was later named for Almira Burrell. They apparently only farmed that area briefly as they were listed in the 1880 census in Monroe County in southern Michigan. The Burrells came New York. Also arriving during 1862 were two brothers from Canada. Alexander (Alex or Alec) and John (30) Heather settled on the northeast end of what is now called Stevens Lake. Alexander Heather obtained a land grant for a quarter section of land in section 3 and a quarter-quarter section in section 14, northeast of Ann Lake. They farmed the land on the shore of Stevens Lake for several years before selling. Only John was listed on the 1870 census. We were unable to find either John or Alexander Heather listed anywhere in the 1880 U.S. census. They may have returned to Canada. 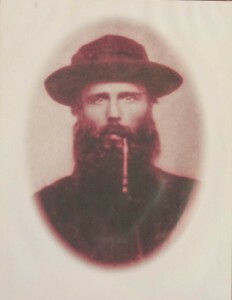 Addison Wheelock, early settler of Almira Township. 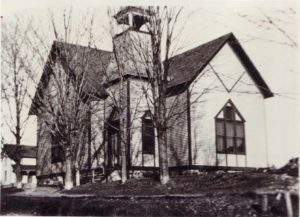 Image credit: Almira Historical Society. Addison P. Wheelock and his wife Ann were among the first settlers in Benzie County, Michigan, and the first in the Lake Ann area. Soon after they arrived from Vermont in 1862, Addison acquired extensive land on the north shore of Ann Lake. Eventually he owned all the land now occupied by the village of Lake Ann. There will be a Fourth of July celebration held in the woods on Mrs. Wheelock’s farm, near Lake Ann. L. Palmer will have his swing on the grounds. J. J. Gray and R. Gane will have a stand where refreshments will be sold and there will be boats furnished for those who like excursions on the water. The pleasures of the day will end with an oyster supper in the evening at Mr. Hathaways. 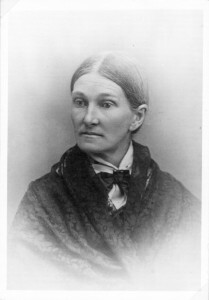 Ann Wheelock, the namesake of Lake Ann. Addison Wheelock was among the founders of Almira Township and the village which later became Lake Ann. The lake was named for his wife, Ann McBride Wheelock. He was active in local politics, was the first sheriff of Benzie County and served on many local committees. Addison acquired much land, most of it land grants from the U.S. government through the General Land Office (GLO). A few pieces of land were purchased from the Auditor General of Michigan in tax sales. By 1872, Addison Wheelock owned nearly 450 acres in Benzie County. On the 1870 census he valued his property at $10,000, far more than anyone else in the area. Sometime during the summer of 1883, Addison P. Wheelock left this area, leaving behind his wife and children. Vague rumors of distant destinations have proven fruitless. In Ann Wheelock’s estate papers, Addison’s address is listed as Bear Lake. This misinformation was probably given by the eldest son, William. The search, now more than a decade old, continues. The Leary’s are volunteers at the Almira Historical Society Museum, whose holdings provided some information and images for this article. Please visit the Museum at 19440 Maple Street, Lake Ann, for further information on the history of Almira Township.